"High Temp." is designed for use in high temperature applications as a single conductor lead wire. It is recommended for use in areas that are exposed to high temperature with a minimum of flexing after installation. Good performance at cryogenic temperatures. Maintains circuit integrity even when exposed to conditions of high ambient temperature and flame. Products and leads for heating elements. Nickel coated copper, solid or stranded. Also available in "A" Nickel. 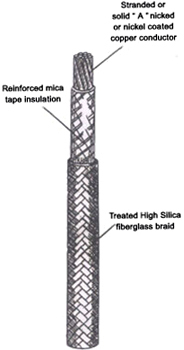 High silica Fiberglass outer braid coated with a high temperature finish. Outer braid may be color coded, natural (tan) is standard.